Pune, 7th July 2017: The Don Bosco Development Society (DBDS) promoted Self-help Group (SHG) women at Pune and Chinchwad to participate in the CSR event organized by AXA Business Services at their Pune Office. SHGs sold their products worth `10,100/- and earned a profit of more than ` 5,000 in one day. All the women who are part of these SHGs are from the slums of Pune and Chinchwad. 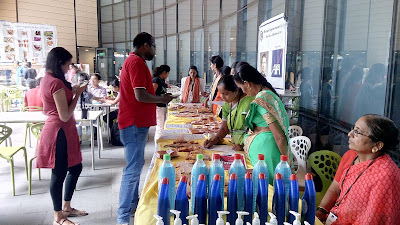 Mrs Ranjana Torane (Project Co-coordinator, DBDS) and Mr Nagsen Chavan (Business Trainer, DBDS) along with other Don Bosco staff participated in this AXA event and arranged facilities for the SHG members.